If you visit Bella’s on a regular basis you must sign up for our VIP Reward Card. Cost is a one off $10 per card! Use your card every time you visit and receive a 5% credit or “bellas money” to spend in house on what ever you like. Accumulate you points & come out for dinner for FREE. You will also receive a Birthday Freebie and access to exclusive in-house promotions. 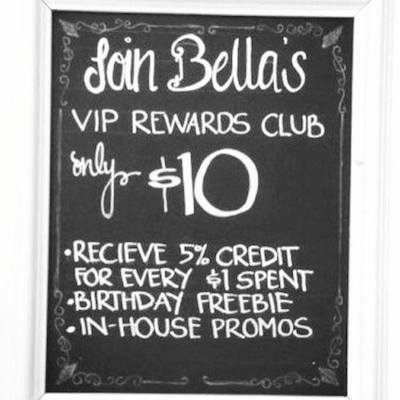 Please speak to a staff member at Bella’s on your next visit about how to sign up to our great VIP Reward Program.